Informational Denver Top Injury Attorney Videos. We understand that being injured in an auto or motorcycle accident can be a difficult situation. You need the best personal injury lawyer to help you resolve problems arising from a car accident, slip and fall, wrongful death or other personal injury claim. We are conveniently located in downtown Denver, Colorado, and have the legal experience and expertise to settle your case for the highest possible recovery. If your loved one died as the result of someone’s fault, contact us to defend their rights. We understand that being injured in an auto or motorcycle accident can be a difficult situation. You need the best personal injury lawyer to help you resolve problems arising from a car accident, slip and fall, wrongful death or other personal injury claim. We are conveniently located in downtown Denver, Colorado, and have the legal experience and expertise to settle your case for the most possible recovery. If settlement negotiations do not work, then, as our track record shows, we are ready and able to take your case to trial. You, as a victim, having been injured by someone else's negligence need the best possible legal representation in Colorado. Our law firm will seek the compensation that you deserve to fully pay you back for your damages. Your damages may include past, present and future medical bills, lost time from work, pain and suffering, and even impairment or disfigurement. When calculating what damages you have from this accident, we look into all aspects, including things like your mileage costs to and from your doctor's appointments, and the sick or vacation time that you had to use for your treatments. It is not fair for you to use your own personal sick or vacation time from work to go to treatments. Our experience in the area of personal injury is notable. 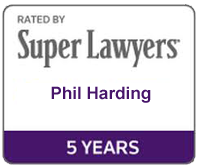 Phil Harding has been elected as one of the top 100 trial lawyers in Colorado for the past ten years. He is a member of the Million and Multi-Million Dollar Advocates Forum, which means he has tried cases that have resulted in $1,000,000+ verdicts. We at Harding & Associates love what we do. We love to represent individuals in personal injury matters, car accidents, motorcycle accidents, wrongful death actions, slip and fall cases and all types of civil litigation. Please call us for a free initial consultation. There is no obligation on this consultation, just call us and ask us your questions. If we don't practice in that area of the law, we will try to direct you to someone who can help you. We feel that being injury attorneys is an important role in helping to balance the power of the insurance companies, with all of their resources, and you who may be hurt in an accident and trying to get better. Do You Have a Friend or Family Member Who is the Victim of a Car Accident? It is important that you call us as soon as possible to help preserve evidence and to make sure all proper notices and procedures are followed. As a car accident victim, you have certain rights to collect damages and to make sure your current and future medical expenses associated with the accident are provided for by the guilty party, not to mention compensation for lost time from work, pain and suffering, compensation for any scarring or disfigurement and even mileage to and from your doctor's appointments. But you need to act swiftly because there may be a very short time frame that must be met or you risk not being to able to recover any monetary damages. These time frames are called Statute of Limitations and they vary depending upon the type of case you have. There is also a very short notice requirement if the government either caused or contributed to your injuries. This notice must be made within 182 days of your injury and must be sent to the proper governmental agency. If you have been injured, don't give up just because the legal process is complicated and the insurance company is making it difficult for you to understand your rights. Your legal matter may be the most important, life changing event you may face. You cannot count on the insurance company to help you because they want to pay you as little money as possible. It is their job to reduce compensation to you so that you will sign a release and "let them off the hook." You need an attorney to help you navigate the legal process and to get you the compensation you deserve - not what an insurance representative tells you your claim is worth. The attorneys at Harding & Associates, P.C. have excellent relationships with their clients and take the time required to ensure their clients make the best possible decisions on their legal matter. TENS OF MILLIONS IN VERDICTS AND SETTLEMENTS FOR OUR CAR ACCIDENTS and WRONGFULL DEATH CLIENTS. You deal directly with the Attorney, not a paralegal or secretary. You have full access to your attorney day and night. You owe us nothing unless we put money in your pocket.